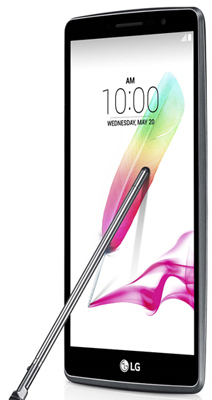 The LG G4 Stylus measures 154.3 x 79.2 x 9.6 mm, weighs 163 grams and comes in white or metallic silver. As the name suggests, the device has its own stylus. With a rubber tip, the Stylus, which LG has named Rubberdium can be used for drawing, note-taking and general doodling. The LG G4 Stylus has a rear 8 megapixel camera with laser autofocus, dual LED flash and optical image stabilisation. The Stylus features a 5 megapixel front facing camera which is perfect for selfies. The G4 Stylus is powered by a 64 bit Qualcomm Snapdragon 410 processor and has 1GB RAM. The device has 8GB of internal storage which can be expanded via a microSD card up to 128GB. The phone has a large Li-Ion 3000mAh battery which provides up to 432 hours of standby time and up to 18 hours of talk time. The Stylus equipped device runs Android 5.0 Lollipop and features NFC, Bluetooth v4, Wi-Fi 802.11 and GPS. The Stylus will be available in both LTE and 3G models.